This easy Roasted Asparagus is super quick to make and is the perfect nutritious side dish to serve with steak, chicken, fish or pork. When is season fresh asparagus is a regular on our menu. I always feel compelled to grab a bunch when they pop up at the grocery store each year, standing upright, as if at attention waiting for someone to notice them. I usually do notice and bring home a bunch or two for this easy and nutritious Roasted Asparagus. Roasting accentuates flavors in vegetables unlike other cooking techniques. Plus, it is so very easy. Simple ingredients and a little bit of time are all that is needed. 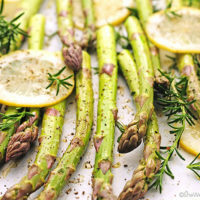 Asparagus, sprigs of rosemary, thin lemon slices, are tossed in olive oil, sprinkled with salt and pepper, then roasted on parchment lined baking sheet until preferred doneness. While roasting, I like to check on the asparagus at about 5-7 minute intervals to avoid burning. Depending on the oven, total cook time can vary. Roasted Asparagus is one of our favorite go-to side dishes when serving fish, chicken or steak. We’ve found it such a great option when serving a larger crowd. Not only is it quick, but a large amount can easily be roasted on one pan. Roasted Asparagus is also great sliced up and added to soups, pasta salads or a springtime risotto. We also enjoy it in Asparagus and Shrimp Salad. I think you will find this Roasted Asparagus easy enough you will add it to your regular rotation too. The next time you’re serving chicken, steak, or broiled fish roast up a pan of asparagus and watch it disappear! This super easy and nutritious dish is perfect compliment for any entree. Prep asparagus shoots, and spread them along with the lemon slices and rosemary on a parchment lined baking sheet. Watch for preferred doneness. Add additional time if needed. Total roasting time should be between 15-20 minutes. Serve warm. Originally posted April 2, 2012. I love asparagus and roasted asparagus is so, so good! It grows wild near my house and we anxiously await spring to come every year so we can go asparagus hunting. A fav-oh-rite veggie here at this house; I’m with you on crispy edges too! Asparagus also tells me spring is here -yahoo! Roasted asparagus is the best way to eat it…it’s so nutty and delicious! Yum. One of our favorites. Our Munchkin loves it too! I am definitely a fan of this! Looks lovely with those lemons! Yum…I love the crispy tips, too! The lemon and rosemary is a great combo. We love asparagus! And seriously, could your pictures BE any more gorgeous! MMMMMM I could eat 4 billion of those. I think that roasted asparagus is one of my all time fav! I must make some sooner than later! Lovely! Roasted brussel sprouts or asparagus is one of my favorites. I love the brown spots and the nutty flavors. Spring is coming! I love seeing nice and simple recipes every now and then. Thanks! Can’t go wrong with this recipe. I LOVE roasted asparagus, but I never thought about adding rosemary into the mix. This is so perfect for spring! Oh, I LOVE roasted asparagus…and AMY! Yours is stunning! 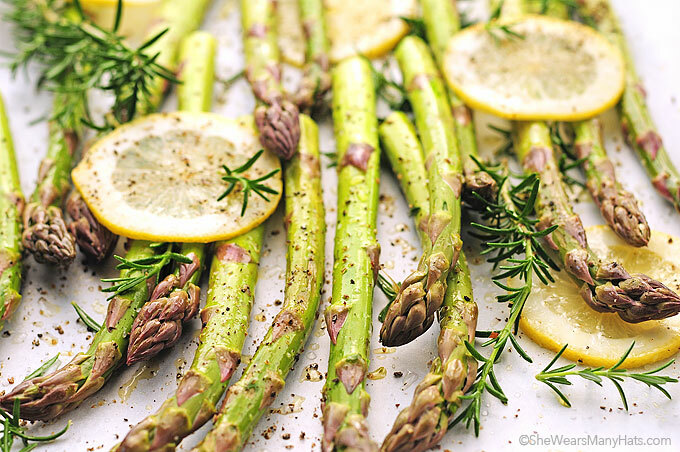 you’ve got me droolin’ over here….we love asparagus and I roast it all the time but never with lemon and rosemary! Got me a new favorite. Beautiful pictures too by the way. I don’t know how you do it, Amy, but you make even asparagus in the raw look oh so delicious! The cooked version looks even better. I can’t wait to try this one! First time visiting your site, it is so beautiful! The asparagus look amazing. Funny thing, I just made roasted asparagus for dinner last night sans the lemon and rosemary. I will definitely will try them with lemon. I bet the lemons give it a nice touch! I’ve never tried roasted asparagus with rosemary before. I’d like to try it! My go-to option with asparagus is roasted with lemon and GOAT CHEESE. It’s pretty mind blowing. these look delecious! thank you for the recipe, will have to try! 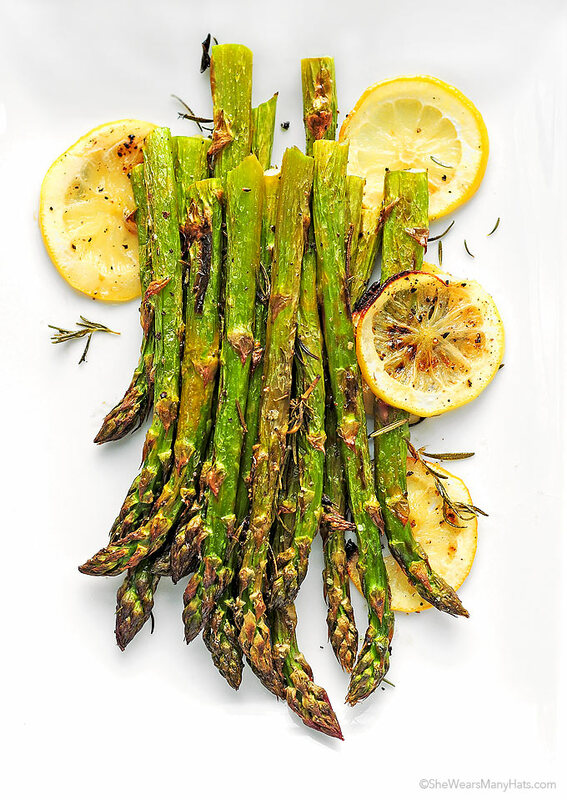 I maintain roasted asparagus with lemon is one of the best veggies, ever. Gorgeous. I made this and added chopped proscuitto and garlic. Yum! Definitely one of my go to spring into summer dishes. Ah heck, anytime of the year really. One of our go to veggies during spring and summer. Roasting asparagus brings out the best test. Great idea and so delicious! Looks healthy as well…love it! Thanks for sharing! 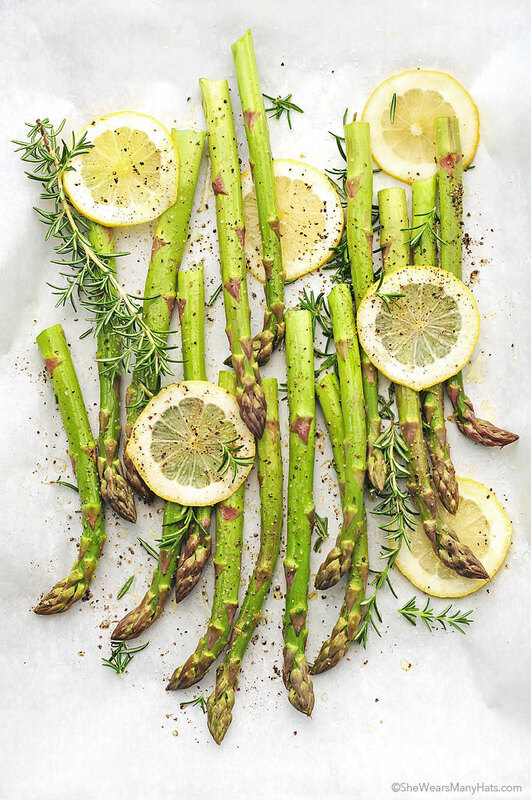 Truly beautiful roasted asparagus…fresh rosemary and lemons….Mmmm! Rosemary grows wild on hill behind my house. Add the lemon slices and this asparagus dish was sublime! I only had the asparagus for dinner and savored every mouthful. Your photo is irristible. What a treat, Teri! We miss our patches of rosemary and can’t wait to plant some more at our new home.